The Midnight Review: "Midnight Review - Exposed" Exposed - More John Smithson Lies! "Midnight Review - Exposed" Exposed - More John Smithson Lies! Conservative activist John Smithson, who doubles as a right-wing blogger and pretend Christian, has decided to step up his attacks against the character of this website (mainly myself) by creating a website specifically targeting myself. Smithson's website, titled "Midnight Review - Exposed," basically copies articles from this website and attaches lies to them to try and convince the reader that I am a fraud, but the funny thing is that Smithson doesn't even try to hide his idiocy. He claims that he had created the website as a way to offer a rebuttal to my articles regarding him because I refuse to post his comments - a claim that is ridiculous because I have posted numerous comments from Smithson in the past. Maybe Smithson didn't notice that at the end of the video it displayed the legally required "paid for" message, or that the video was posted on Charlie Crist's YouTube channel. Does Smithson seriously believe that I organized an event at the local plumbers and pipe fitters union to fake a video showing my support for the governor? Can Smithson explain the existence of the governor at the event? My photographs of those in attendance, including my picture with the governor? Smithson's claim is ridiculous. I also wanted to point out one other thing about his post - the title. Smithson wrote that I pretended to "interfiew" those at the Crist event. This spelling error is quite funny, but also something Smithson does quite frequently, and hypocritically at that - Smithson recently posted an article attacking a grammatical error in one of my headlines (Smithson must have grabbed a screen shot before I corrected it). Unlike Smithson, I correct any errors in my posts. The original title of the article above was "Sarah Palin Violated The Constitution Of Alaska." I added the "Did" in the beginning and forgot to change the "Violated" but after proofreading my post after I published it I fixed the headline. It's been almost two weeks since Smithson's "interfiew" gaffe and still no correction. I also wanted to point out that Smithson wrote that I claimed to live in New York, but anyone with half a brain would see that on the "About Us" page I state that I am "originally" from Brooklyn and that I was attending school in Florida. Does that sound like a claim that I currently live in New York? In addition, I wanted to shed some light on this other blog post by John Smithson that supposedly exposes myself - a post alleges that I had published a political blog from 2002 to 2004. That is a lie. 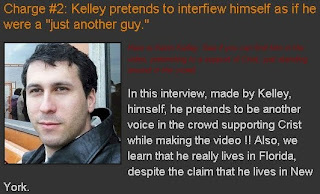 The website Smithson is referring to is a blog by a man by the name of Kevin Kelley. Smithson believes this is me, but if you look at what Smithson wrote, you would realize that he does not understand what he is writing about. For instance, he wrote that this "Kevin" person "quit the blog sometime before his 15th birthday." I have written numerous times that I had voted for President Bush both times, as well as other politicians, such as Jeb Bush (both times) and Ric Keller (all four times). How would I have voted for these people if I supposedly quit this other blog when I was 14 years old in 2004 when these politicians were elected to their first terms prior to that year? The answer is that I was not a 14-year old boy in 2004 who operated a political-themed blog. What's odd is that Smithson's whole problem with you could easily be solved by him just acting with any kind of decency. This back and forth started with his coming here out of nowhere and throwing accusations around. Then when you tried to have open discussion he either ignores it, or twists your words around. You then focus more on his blog, discover some hypocrisies with his accusations and point them out. He then reverts to personal attacks and abusive language. When you start moderation to avoid having to weed out his blatant disregard for common courtesy he opens up his "libel/slander blog" about you. If Smithson really was honest about wanting to settle things with you all he needed to do was ask nicely for you take down any copyrighted material if you had any, stop his accusations which have been proven incorrect and not include personal attacks with his comments. Basically, if he acted as if he was conversing with you in real life on the street or in a cafe rather than as an "anonymous" online persona. Most likely, his John Smithson online presence is an act to drive traffic to his site and get attention, in which case it's probably working as he benefits from your higher traffic.